The Virginia Wine Country Half Marathon was our Summer Race with Team Challenge after we were unable to participate in the Chicago Half Marathon which was this past weekend. My parents traveled to Virginia on Thursday for the VIP dinner while I arrived on Friday. Upon arrival, we spent time with Sarah and Brian Kubicki who are superstar fundraisers from Team Virginia for Team Challenge whom we have become close with since we met them last year at the same race. Sarah was unable to run due a stress fracture. She was the third best fundraiser this year. We played a round of golf with Brian and then went to the Inspirational Pasta Party. Kathy Boggan was the MC for the Pasta Party and did a phenomenal job. We were recognized as the top fundraiser and a lady on Team Philadelphia gave a moving speech about her experience with Crohn's Disease. On Saturday morning, the weather was already in the 70's by 6AM as the sun started to rise. By the start of the race the sun was directly above and it was clear that times would be negatively affected by it. The winning time was roughly 7-8 minutes slower than usual. My personal time of 1:28:30 was done at a casual pace, but definitely did not feel easy by any means. The time was well enough for 13th place overall and 2nd in the age group. My mother and Sarah were unable to do the race due to injury but conjured up a group of ten people or so who did a walk across the finish line. My mother trained hard throughout the winter months but had an appendectomy in May so had to sit out. She is thinking of doing a half marathon soon. On Saturday night we spent time with the Kubicki family as well as many other Team Challenge friends we have made over the years. We watched the Bruins beat the Penguins which showed to be a sign of things to come. The Virginia trip was a good time. 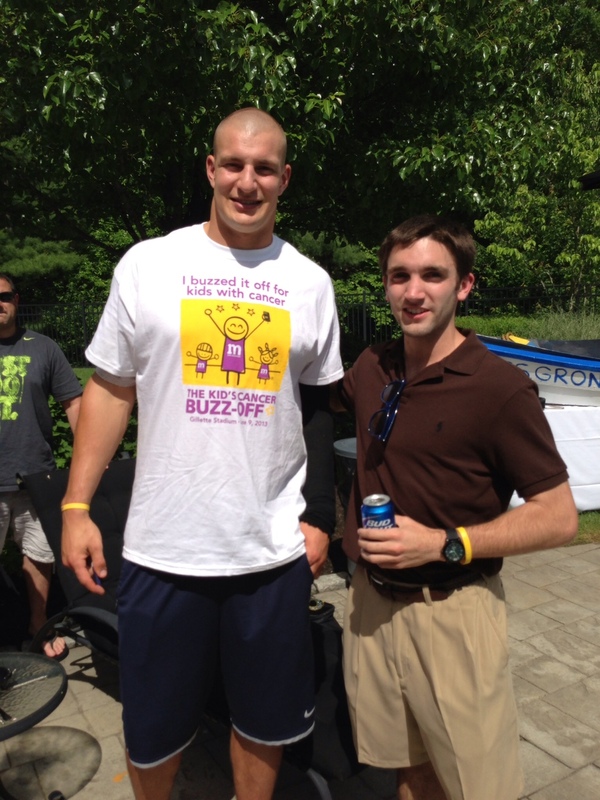 This past Sunday, we had a great time at the "Gronk Clambake". This was an auction item at our annual dinner, auction and raffle event at Thorny Lea. Close friends, Dave Howe and Doug King won the item pretty handily. The item was a catered event by TIF Board Member Jim Messinger and Crazy Chefs Caterers with 100 people including New England Patriots star Rob Gronkowski. Dave and Karen Howe were extremely accommodating hosts and Jim's food and creativity was excellent as usual, including a boat of clams and shrimp named "S.S. Gronk". We also had Patriots safety Steven Gregory in attendance who is a very stand up guy out of Syracuse University. Gronk and Gregory both were gracious to anyone who approached for an autograph, a picture, or just to chat. Gronk and Gregory played toss and ran routes with some of the younger kids in attendance, which will surely be a memory that they will remember forever. Although I don't get as star struck as I used to, it was pretty surreal to have one of the best tight ends in the game introduce me to the crowd to deliver a quick word about our cause and the reason we were holding the event. Special thanks to the Howe family, King family, Crazy Chef Caterers, Gronkowski and Gregory, and everyone who attended. The rest of the summer will be a busy time of year for Team Intestinal Fortitude. We are currently recruiting for the Narragansett Summer run on July 21, 2013. This will be a road race held in Easton, Massachusetts. We have partnered with the race organizers and our idea is to fundraise through people who want to participate through Team Intestinal Fortitude. The event will be a 5K, 10K, or half-marathon so we are seeking participants who would like to raise funds for CCFA at tiered levels of fundraising depending on which race they end up doing ($200, $350 and $500). More details on the race can be found here http://www.gansettrun.com/. And to register through TIF here is the link http://www.gansettrun.com/#!team-intestinal-fortitude/c214d. Our initial idea of fundraising for CCFA before joining Team Challenge was to host a road race in Easton so we are proud to be the fundraiser affiliated with this race in our hometown. Another summer event to help raise funds for CCFA is the "Pier Madness - PREP for Summer with CCFA" on June 27th in Charlestown, which will be hosted by the recently developed Young Professionals Group of New England. The tickets are $125 and will include dinner and drinks. We are pushing for final sales as this event is less than three weeks away, as well as corporate sponsors or donations. We anticipate this to be a fun event for the younger demographic. We will keep you posted on all new things this summer. Thanks for your continued support.